Knickernappies Sighting: The Examiner, WeeLittleChanges & more! Today we've got some fun Knickernappies Sightings around the World Wide Web! In The Examiner, Sara Stone talks about her experience giving modern cloth diapers a try by purchasing a Diaper Trial from DiaperDaisy. A Knickernappies OS diaper was one of the 3 diapers she received. She discusses her trial day-by-day and how she's finding the right combination of what works for her by experiementing with different inserts, doubling up, etc. This is a great little post, head on over and check it out! WeeLittleChanges is on a roll! I think they're setting the world record for most amount of Knickernappies Reviews on the web! We're loving all the awesome reviews and it's great to see a retailer with such motivation and dedication. Check out the WeeLittleChanges Blog and read todays Knickernappies Review by Amber. Want to read more about what people are saying about Knickernappies? As always you can head over to Diaperpin.com and read all the customer submitted reviews. 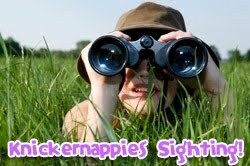 You can read reviews of the Knickernappies OS Diaper, Knickernappies 2G Sized Pocket Diaper, LoopyDo Inserts, SuperDo Inserts and much more! Have you used Knickernappies products before? While you're there you should submit you're reviews, we'd love to read them! Thanks for visiting little miss momma! I am now a follower of your lovely blog and a new fan of your business!